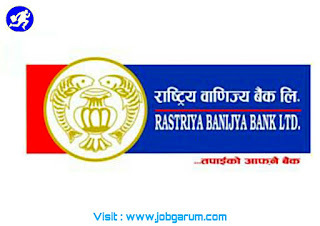 Nepal SBI Bank Ltd is a leading “A” class commercial Bank in Nepal .Which invites application for branche's and offices in and outside Kathmandu valley and from qualified, competent and enthusiastic Nepali citizen's interested to pursue their career with the Bank for the position's of (Junior Assistant). Minimum Bachelor’s Degree with any other equivalent graduate/post graduate degree . 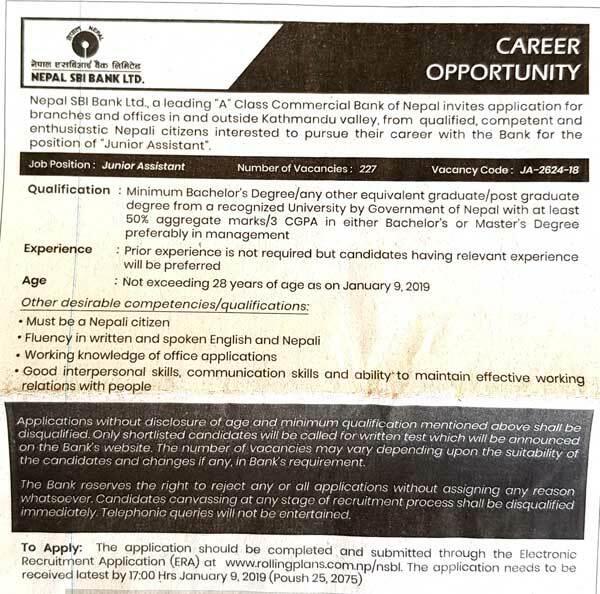 From a recognized university and by Government of Nepal with at least 50% aggregate mark's or 3 CGPA. Degree in management is preferable. Prior experience's is not required but candidate's having relevant experiences must will be preferred. Not exceeding 28 year's of age's as on January/9/2019. ▪ Must be a Nepali citizen. ▪ languages must be written and spoken English and Nepali. ▪Working knowledge of office application's. ▪ Good interpersonal skill's, communication's skill's and ability to maintain . ▪Effective working relation's with people. The Bank reserve's the right to reject any or all application's without assigning any reason whatsoever. Candidate's canvassing at any stage of recruitment process shall be disqualified immediately. Telephonic querie's will not be entertained.